Then, we paid another $1 (cash) to board the smiley bus (yellow) CW1 which will then bring us across the causeway to Johor CIQ. Again, there was alot of people going into JB that day and we spent another 40 minutes to await our turn to get through the Malaysian customs. Please note that there's no toilet at the Johor CIQ after you've cleared the customs. Nearest washroom would be at City Square mall. There's money changer and you could also get local data SIM card there too. Digi is offering 1GB of data and able to make local calls at RM10. Adequate for 5 hours of usage and kept us connected during our day trip there. Just remember to restart your phone after the installing the SIM card. All in all, allocate about 2 to 2.5 hours to travel from Singapore to Johor Bahru inclusive of clearing the customs on a Saturday morning. After which, just follow the link bridge to City Square Mall to start shopping or to hop onto a cab to bring you to your next destinations. 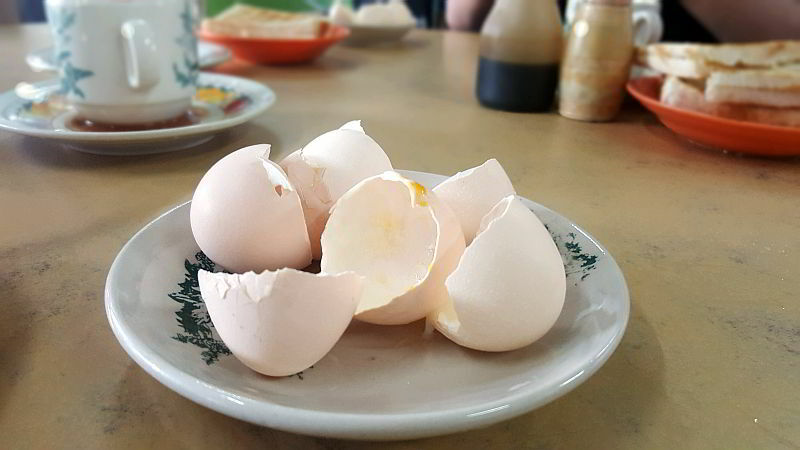 An old school coffeeshop that serves up eggs and toast nanyang-style (think soft-boiled eggs and charcoal grilled toast), good ol-kopi, hainan chicken rice, fried kway teow and yong tao fu. There were a lot of uncles and aunties enjoying their weekend breakfast there. 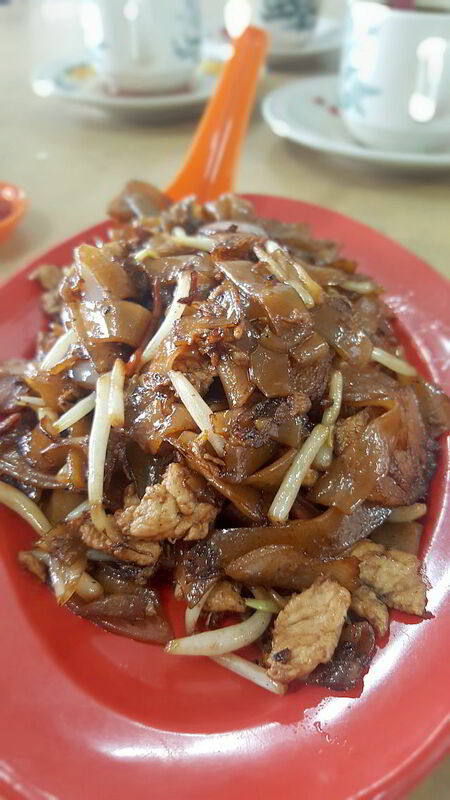 Wanted to order char kway teow (those with seahums) but ended up with a plate of fried hor fun. Haha! But it turned out to be quite good. Enjoyed our breakfast there especially those who ordered the organic kampong chicken eggs. The chicken rice looked promising with its chunky 'white' chicken but a customer whispered to our ears and said that the chicken was a tad rough for that day so we ended up not ordering any. Was supposed to try wild boar meat on our next stop but unfortunately, it wasn't open at the time that we wanted to go. Plus, it was drizzling so decided on bak kut teh for lunch instead. It's a curious place. It looks like it has a cafe-front that also sells local products like heong peah (biscuits), chinese new year cookies and coffee packs. 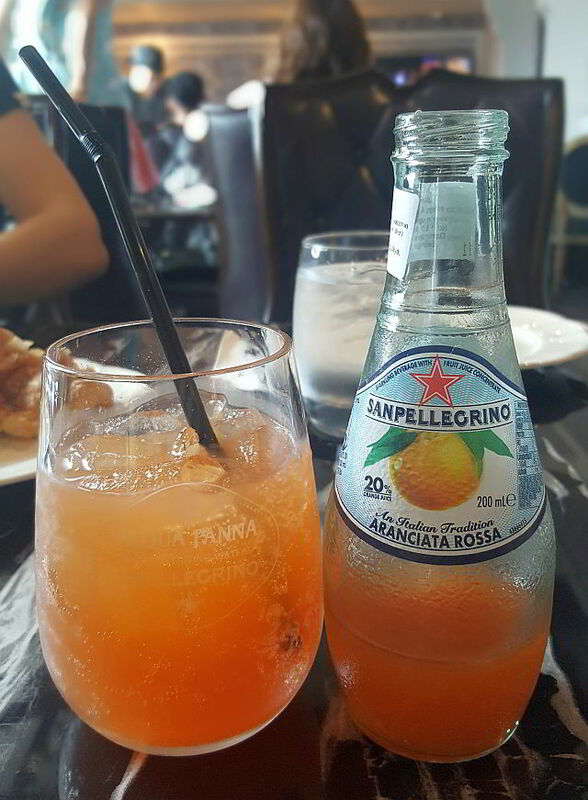 It even has cold-press fruit juice! But the back of this shop, is where one could order the bak kut teh. 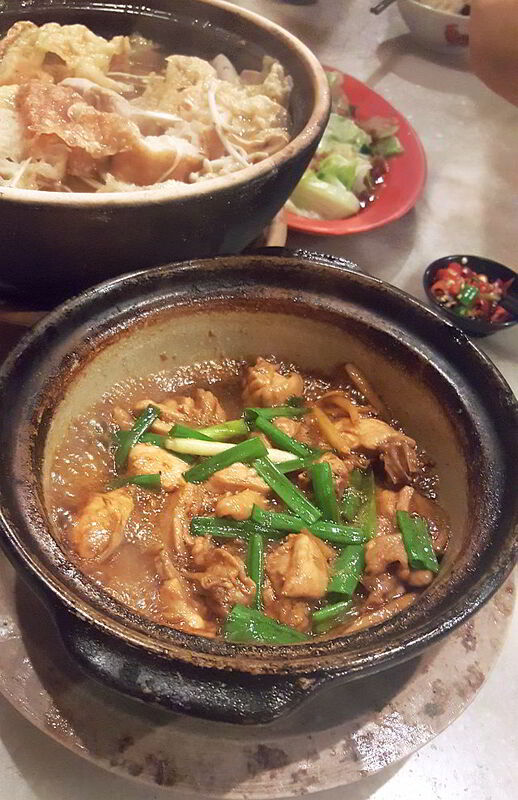 One pax pot is priced at RM14 while a 4-pax pot is priced at RM56. We took the 4-pax pot and added everything on their menu except kidney since we ordered a pot each of kidney and chicken in ginger and wine sauce. 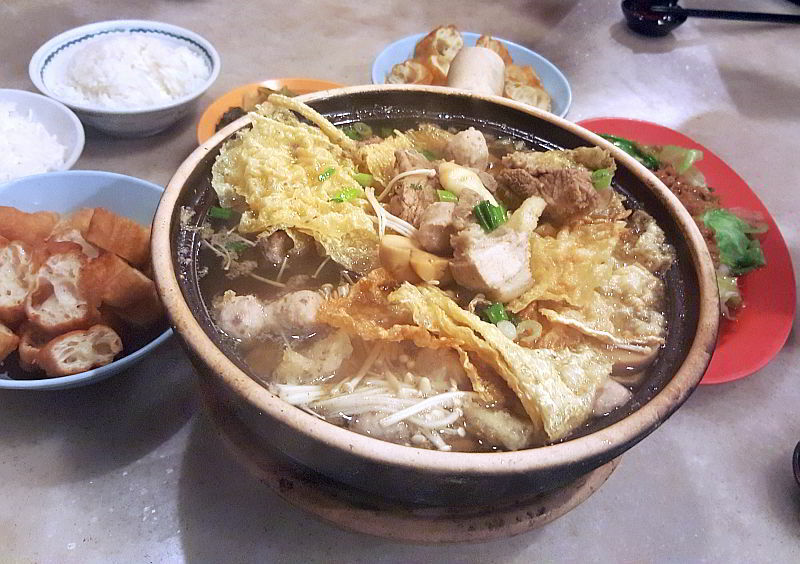 The bak kut teh here is leaning towards the peppery variant instead of the herbal variant. The soup was pleasantly mild. Loved the ginger wine claypot chicken. Such tender bouncy meat and a slightly sweetish sauce with a tinge of chinese wine taste. Great sauce to go with the steamed rice. A rather opulent looking bakery-cafe with interesting facade and decoration. 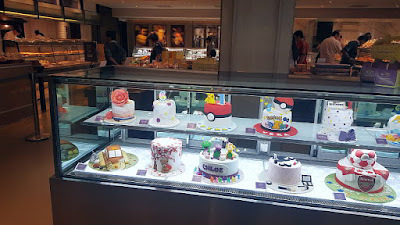 It sure has very pretty looking cakes. The dining area is at Level 2 and it has its own lift too. The view at the balcony is pretty nice too but unfortunately, that's also the smoking area. 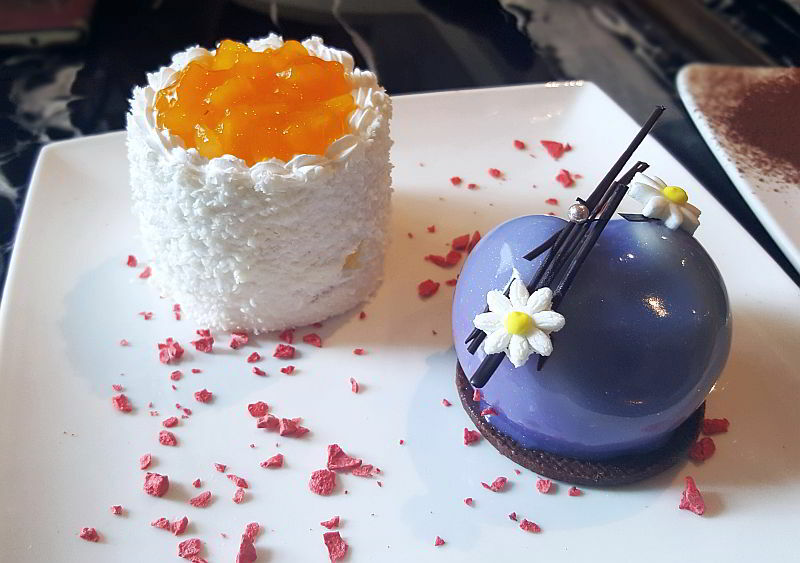 One chooses the cakes either from Level 1 or 2, make payment and the staff will serve them when you are seated. All the tiny pretty looking cakes were retailing for RM14.70. P&P, pricey and pretty. Taste wise, we enjoyed the gelee like skin of the D'Or and Lavender. The Mango Charlotte was ruined by the mango toppings which had a flavour that wasn't agreeable to us. "It didn't flow." We were saddened. 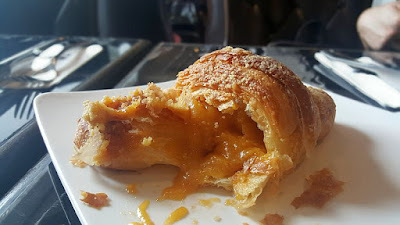 That was the reaction and we thought it was because the lava had hardened when the pastry had cooled down. So, off it went for a reheat and it turned out the same. 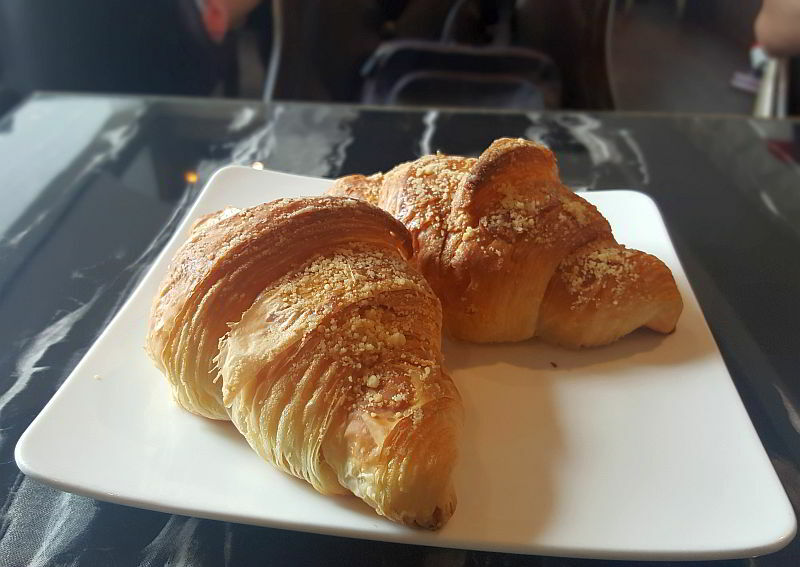 Nevertheless, the croissant was adequately flaky and buttery with the salted egg yolk fillings having a custard-like texture. 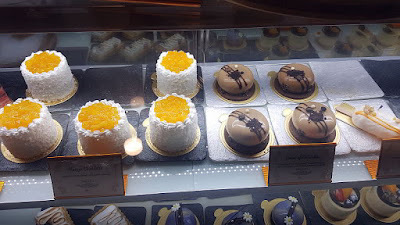 As this place is nearby 7 Oaks, plus it has the much raved about cheesecake by Tiara and Ivan, hence, it became a must-visit place with a mission to purchase the cheesy goodies. The flagship store is huge! There was a nice guard who opened the door and welcomed the guests with a smile. Wow! The shop has counters to display the cakes, tarts and also the usual shelves to display the daily bakes. So many variety and one getst that feeling needing to buy this, that and well, almost everything! Interesting much! For tourists, you may want to purchase individual items and try it at their cafe with a cup of coffee before deciding what to buy back. 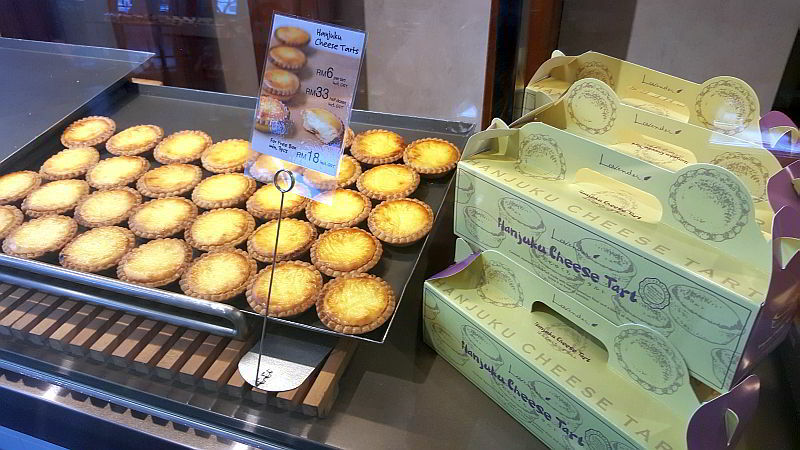 We tried the hanjuku cheese cake, cheese tart and also the nama chocolate cake. 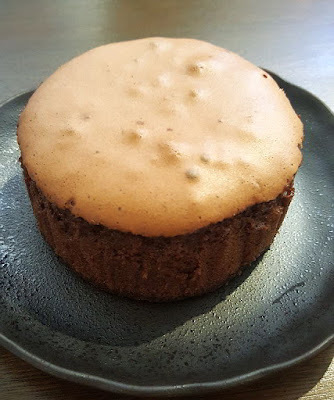 Made a mistake of taking a big big bite of the Nama Chocolate cake. 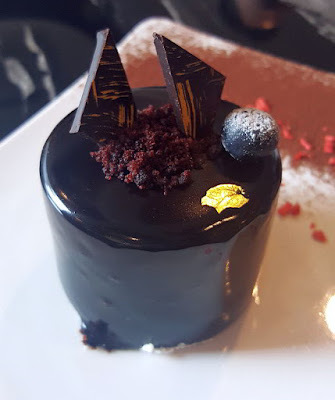 As its namesake suggests, the texture of nama chocolate which in a way had sort of a dense texture once it gets into your throat. Hence, savour this cake/chocolate slowly. Velvety smooth and not too sweet. One cake is shareable by 4 to 6 pax. 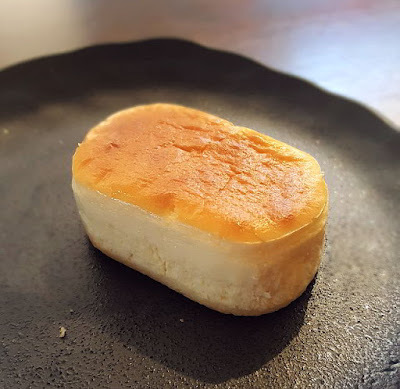 If you think about it, RM3.80 for a tiny weeny piece of cheesecake that can be finished in 2-small bites is really expensive. After conversion, this is about SGD1.25 apiece. But, it was really good. So soft, so cheesy, so enjoyably sweet. You can purchase this in a box of 4 or 6 pieces and can be kept for up to 5-days in the fridge. 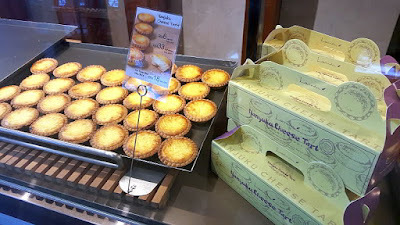 Even more exhorbitant pricing, was the Hanjuku Cheese Tart at RM6 per piece! Smaller than Prima Deli's cheese tart, I think. 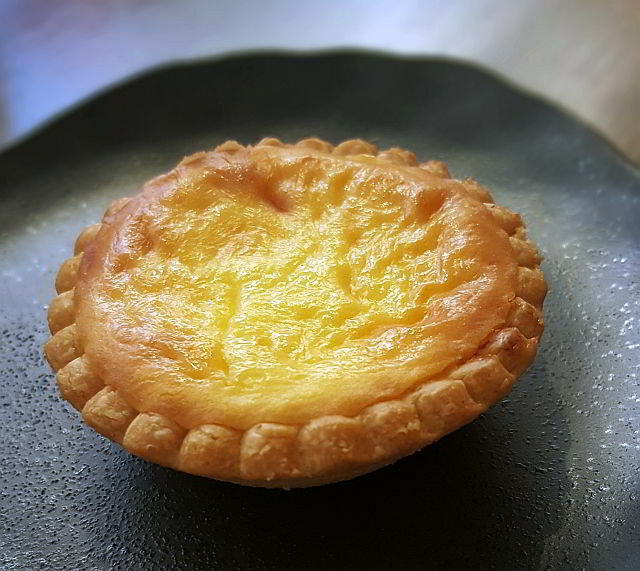 This version has a crisp crust and the same cheese as the cheesecake but a tad firmer. Amongst the group, some prefer this over the cheesecake. Seafood restaurant! Yay. 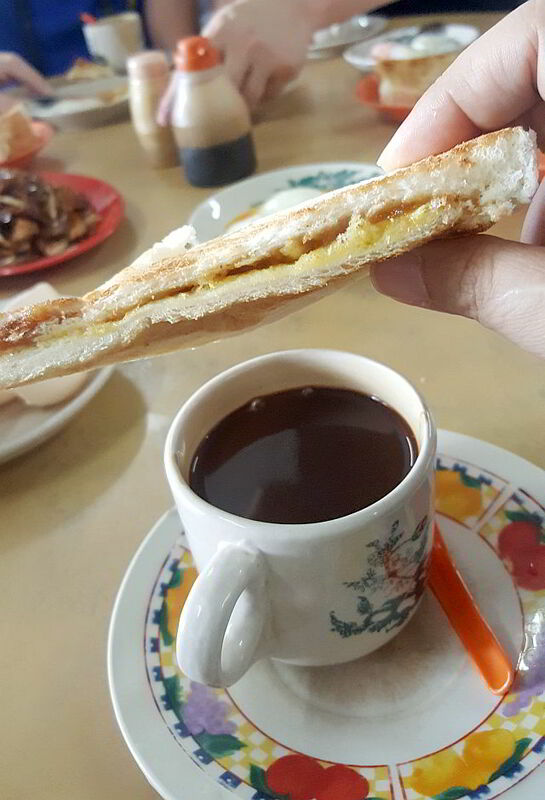 This was what we needed as a finale for our day-trip to JB. And, the address amuses me. 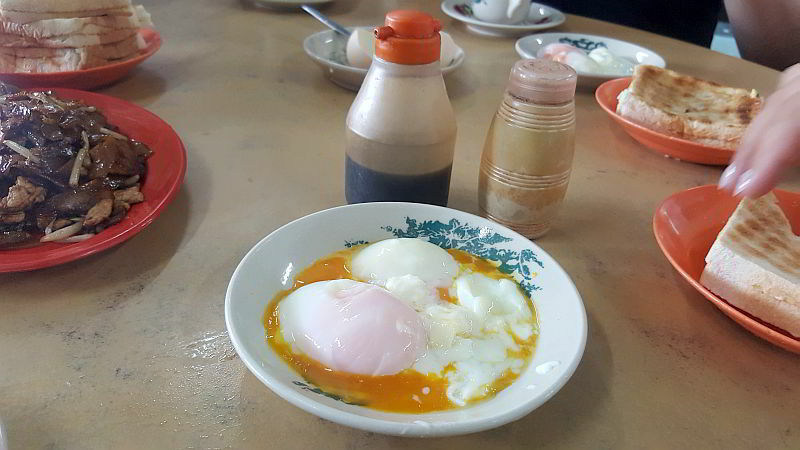 Jalan Kacang Panjang? Why, that's Long Bean Road! Hahahaha. 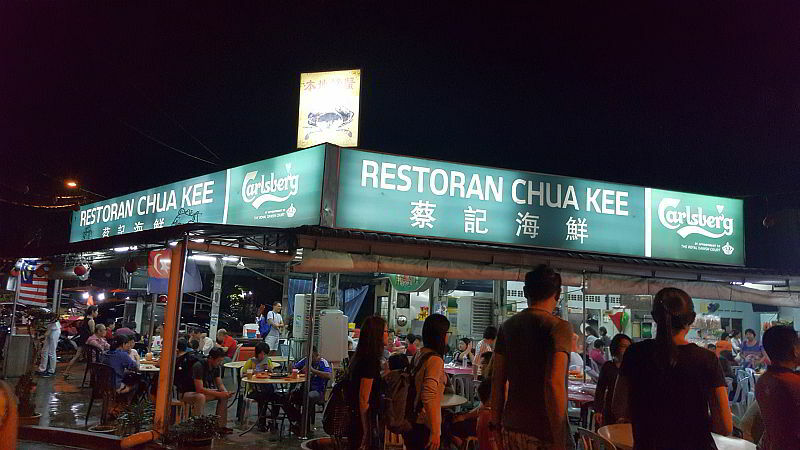 The restaurant has its own parking space which is at the opposite road. It was raining that evening and the parking lot road could get quite muddy. With nary a care to the price, we ordered away. 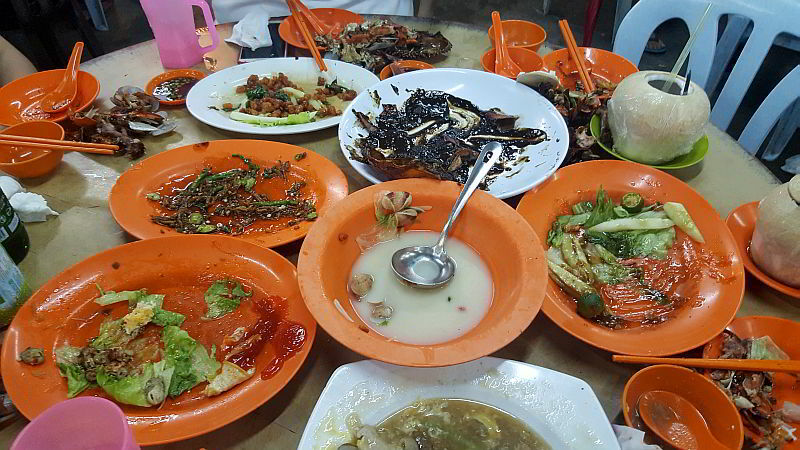 There's 6 of us and we ordered 8 dishes. Yup, that's our style! 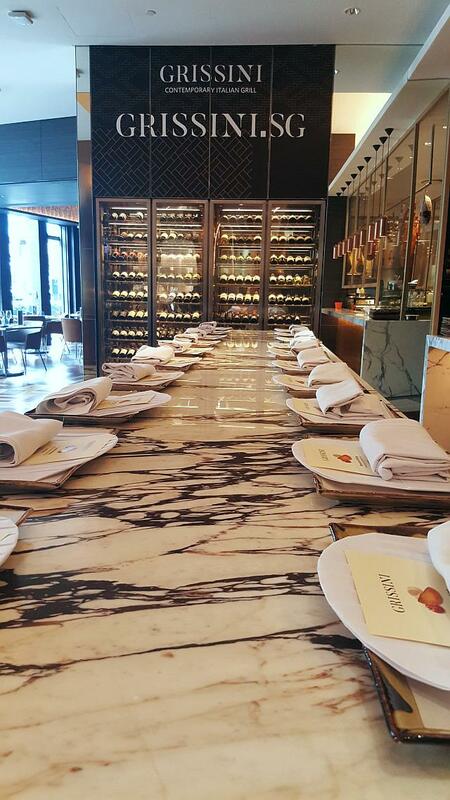 As first-timers there, we ordered their signature dishes. 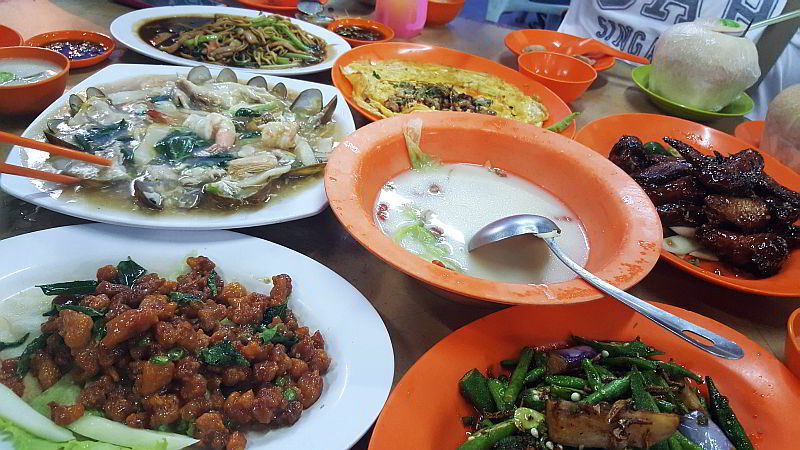 We had a complete meal which had soup, vegetable, egg, meats, seafood and carbs. 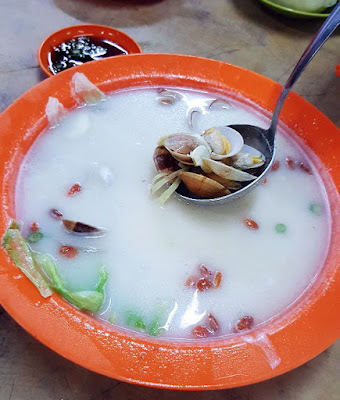 The soup was an interesting milky coloured ginger clams soup with some wolfberries and lettuce in it. Comforting bowl to start off our dinner in the cold weather. The butter chicken cubes were really tiny tiny deep-fried flour coated chicken with sweet savoury spicy sauce. 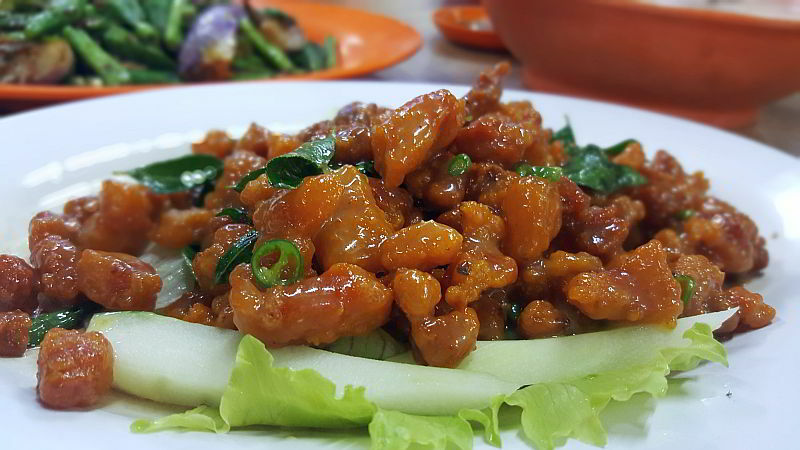 Addictive like a crispy sweet-sticky popcorn chicken. The seafood horfun has an interesting visual. Loaded with clams, some lean pork, fish cakes and prawns. 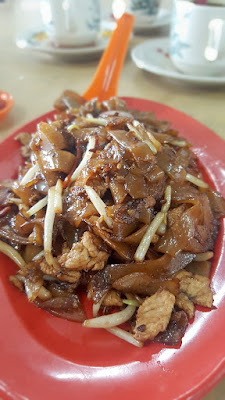 The hor fun had good wok-hei, and you can't help but to scoop up some more after you've tasted this. Or, was it because we were hungry? Can't be, 'coz this was our fifth stop of that day! The must-must order is really the seafood. The crab. 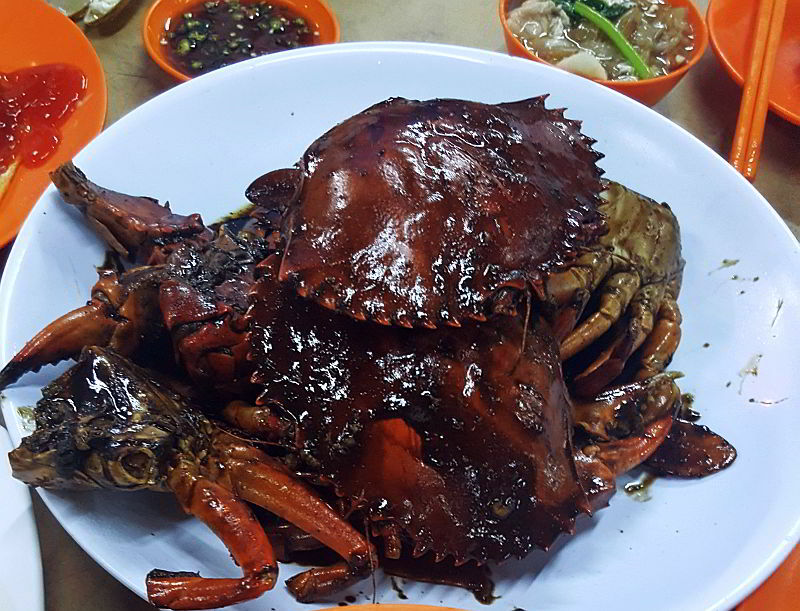 We had two good sized crabs done in black pepper sauce style. Has a spicy kick and so shioks. The meat was fresh and sweet and not too firm. Lovely! Will come back for this. Thoroughly enjoyed the day with fellow foodies. 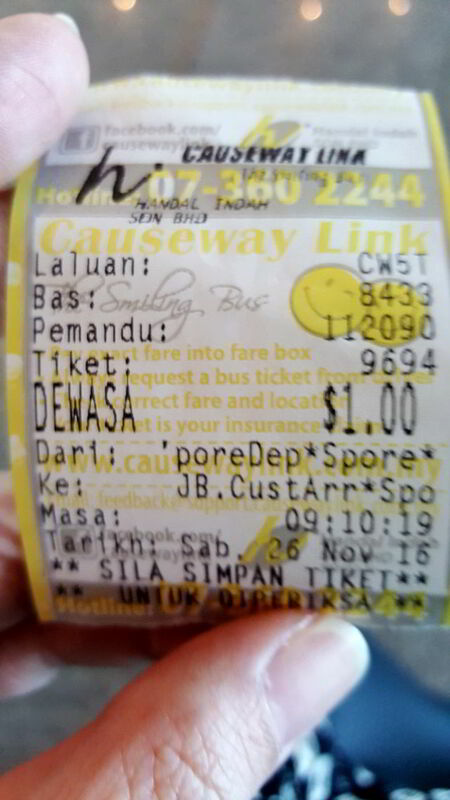 My spend on that day was about SGD50 for a taste of the above. Thank you Hence for getting us around JB, Tiara and Jen for the bus-trip company from SG to JB, and Kris, Tracy, Ivan and Justin for the makan recommendations and queuing up at Hiap Joo Bakery. Informative Post. 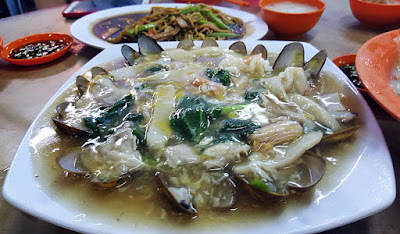 I am a Singaporean living in JB as I am always on the lookout for places to eat.I am going to try Chua Kee Seafood at Gelang Patah. You took very good photos. Food look very yummy. Thank you for dropping by. Hope you'll enjoy the good food in JB! The Food in Johor Bahru is super exciting,you must be a foodie or a super cool photographer the shots are taken very precisely,but more than food im eagerly waiting to visit Lego land after visiting this post https://www.johortransport.com/legoland-malaysia/ my excitement pumps up,hey what about Cost of living there? especially hotel costs?i dont know anyone there have to stay in a hotel. Wish list!!! Johor looks like something from another world, and your photos capture it beautifully!